Rising Tide: Do College Grad Rate Gains Benefit All Students? More than two-thirds of four-year, public colleges and universities have increased graduation rates in the last 10 years — not only overall (5.3 percentage points), but for underrepresented students as well (6.3 percentage points). Among underrepresented students, gains were greatest for Latinos (7.4 percentage points) and smallest for black students (4.4 points). Native students saw an increase of 6.4 points. They are certainly improvements to celebrate, but they are not enough to close gaps in completion anytime this century. Even with the improvements seen this last decade, underrepresented students still are not graduating at the same rate as white students were 10 years ago. A 14-percentage-point gap in completion remains between underrepresented and white students. What institutions do — how they dedicate resources and support students — matters. 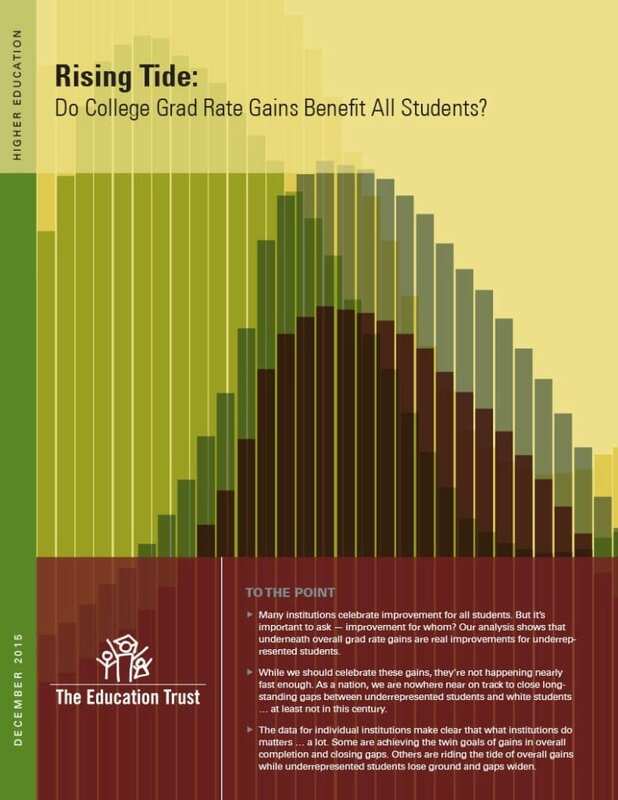 In Rising Tide: Do College Grad Rate Gains Benefit All Students? we highlight institutions that are achieving the twin goals of increasing overall graduation rates while closing gaps through intentional efforts to help underrepresented students arrive, transition, and thrive in college.